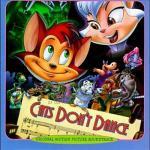 "Danny the Song and Dance Cat"
It's as clear as the nose on your face! Where the streets are paved with gold! Where the kitties never grow old! Where the stars don't shine at night! Ya ain't seen nothin' like it anyplace! I'm gonna be the cat to see! Where dreams can never grow old!